I’m going to be talking about the impact of coal corporations on policy making in the US. I’ll describe the disproportionate exposure of certain communities to coal and then discuss what affected communities are doing. 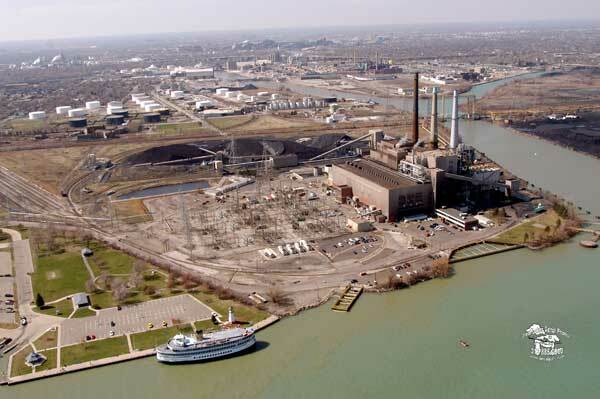 71% of African-Americans live in communities with exposure to coal-fired power plants such as the River Rouge plant to the left. It’s not just about class: an African-American family making $55,000 per year is more likely to live in close proximity to a power plant than a white family earning $15,000. Disproportionate health impact of these power plants on communities of color include respiratory diseases; heart disease; attention deficit issues. African-Americans are twice as likely to die from an asthma attack as whites in the US. When you tie these issues to problems such as education and emphasis in the US on building up the prison system rather than the education system, you see the disproportionate impact of coal-fired power plants and climate change on communities. Coal Glutted: Putting Profits Before People report from NAACP details impact of coal in the US. Owner of three of the top 12 EJ offender plans, Edison International, earned billions of dollars. Their CEO earns $9.5 million dollars per year – gleaned from the AFL CEO database. Average CEO pay was $9 million dollars, while average worker’s pay was $30,000. Total lobbying in 2010 by Edison International was $13 million, going towards arguing against all forms of environmental protection. They also spend millions lobbying against renewable energy such as Renewable Portfolio Standards, which would require utilities to purchase 15% of their power from renewable energy sources. Our strategy: educate and organize our communities; create a compatible policy landscape; advance just transition policies. More information is available at the Environmental Justice Resource Center. Other campaigns: go after banks that fund big coal companies and cut the purse strings. I’m going to talk to you about environmental justice issues in the city of New Orleans and the Gulf Coast. The work I’ve done and attention I’ve gotten has been because of where I live. These issues have become personal to me because of where I live. All my life we’ve experienced explosions from refineries. When Ronald Reagan was elected, he withdrew money from inspectors, leading to far more explosions. New Orleans is 69% black, and yet we still lived as a whole closer to toxic facilities than white folks. That’s also try in majority white areas. We find almost identical conditions in Cancer Alley in Louisiana and in Durban, where communities of color are disproportionately located near power plants, refineries, and other polluting sites. Pictures we took in both sites show children playing in front of refineries in parks donated by polluting chemical plants. In Louisiana, coastal land loss is a serious issue. The levees that were built are not dependable; subsidence is an increasing problem; storm surges can overwhelm levees; oil and gas drilling and infrastructure destroys wet lands. Almost everyone knows about Hurricane Katrina, but most people aren’t aware that the storm never really hit the city. It was storm surge that flooded the city. With wetlands removed, the city was vulnerable and the surge overtopped the levees. We still have over 100,000 people who have not been able to return, mostly for political and economic reasons. This takes us to corporate influence in the US. As a result of this influence, we have no disaster prevention or mitigation. Toxic facilities are given permits to pollute communities of color, erode coast lines, and build substandard levees. It was hard for me to to understand that this permit process legitimated the killing of our communities. We’re trying to find loopholes in the permitting paperwork. 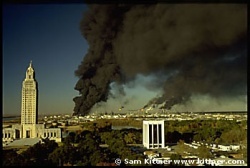 When polluting facilities were shut down in NJ because of legislation, they came to New Orleans, which was so corrupt that people could move into Chemical Corridor, which emits 700 million pounds of pollutants per year. In addition, we seem to have no right to recover from a disaster. We found out after Katrina that only projects that were in place were for rich, white communities in New Orleans (downtown and uptown). Monique Harden, who’s in the audience, explained to me that the US has international treaties to protect refugees abroad, but we have no such treaties for the US. The year of the BP oil spill in the Gulf, the company spent $7.5 million dollars on lobbying and made $16 billion on lobbying. There are 27,000 abandoned oil wells in US coastal well, and 79 “deep water” drilling wells in the Gulf of Mexico. We only have 62 inspectors responsible for all US oil wells. The BP disaster shows that this isn’t working. I remember the spill happening, and thinking “they’re killing us.” Oil industry is able to win people ovly with promise of new forms of jobs. Massive damage to other marine life, including by dispersants released to dampen down public alarm. BP directs government response to disaster. This was terribly frustrating. Huge fights broke out, for example, because BP doesn’t want people to wear adequate protective gear because it’ll make for bad public relations. Where did waste tat was collected go? Majority of waste goes to other states. All landfills were in African-American communities. BP restricts photographs of wildlife that are affected, afraid that this will make for bad publicity. Corporations control politics in Louisiana, just like they do here at COP17. We live in a capitalist system, what I call “cowboy capitalism,” because it’s out of control. Why don’t we all get on board? Some people seem to believe that, as bad as it gets, they’ll be able to buy their way out of the problems. In Louisiana, we’ve been doing this dance for many years. Augustine Njamnshi of Pan-African Climate Justice Alliance. My colleague from Nigeria was supposed to present here, but at the last minute he backed out. I think that this shows how afraid some people are to challenge big corporations. For us here in Africa, this is a life or death issue. The issue of African independence came up last year when most of the countries of Africa were celebrating their 50th anniversary of independence. Are we truly free? One form of colonialism was replaced with another. Our leaders cannot take decisions because of the impact of corporate power. I come from Democratic Republic of the Congo, which has some of the richest resources on the planet, but the people who live there are condemned to poverty. Why so? Because there is a business mafia that one cannot talk about. We need to let the communities speak for themselves. And we need to make sure that negotiators at COP17 are working for them not for corporate interests. Mohamet Lamine Ndlaye of Oxfam Africa. This struggle is not just about countries, but also a class fight. We need to understand the complexity of the different powers within our countries. We’re critical of the unfolding wave of land grabs. Many don’t like to use this term, since it’s so polemical. The World Bank report says that 227 million hectares of land have been bought between 2001-2010 in developing countries, a space the size of Western Europe. Most of this has been in Africa: Mali, Somalia, Ethiopian, and Sudan. When companies want to buy land, they look for countries where governance is weak. They want to grow biofuels for their cars on this land, and represent the land as unpopulated. But when they take over the land, they dispossess pastoralists who have been using this land for many years. In 2008 there were food riots throughout Africa, where people spend 70% of their income on average on food. They’re so close to the edge that they’re ready to explode. The other reason we’ve had land grabs is because of hedge funds, which engage in speculation by buying land. There is less and less land, while demand for land is increasing. In rural areas, women produce most of the food, accounting for 80% of farm work in Africa. Land rights are human rights. You cannot take away land without full free prior informed consent; rights holders must have access to remedies if their rights are violated; contracts must be transparent. In Uganda, more than 20,000 people were evicted without compensation to make way for timber plantations run by UK-based New Forests Company. NFC claims that it is sustainable and socially responsible, and that the evictions were the responsibility of the Ugandan National Forestry Authority, and that everyone left peacefully and voluntarily. People on the ground, however, say that they were violently evicted. Climate change is not only an environmental issue. It is a human rights issue.